When climate deniers are desperate because the measurements don’t fit their claims, some of them take the final straw: they try to deny and discredit the data. The years 2014 and 2015 reached new records in the global temperature, and 2016 has done so again. Some don’t like this because it doesn’t fit their political message, so they try to spread doubt about the observational records of global surface temperatures. A favorite target are the adjustments that occur as these observational records are gradually being vetted and improved by adding new data and eliminating artifacts that arise e.g. from changing measurement practices or the urban heat island effect. More about this is explained in this blog article by Victor Venema from Bonn University, a leading expert on homogenization of climate data. And of course the new paper by Hausfather et al, that made quite a bit of news recently, documents how meticulously scientists work to eliminate bias in sea surface temperature data, in this case arising from a changing proportion of ship versus buoy observations. 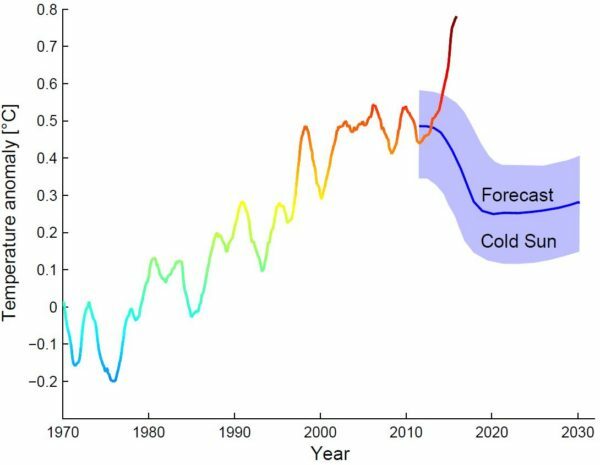 To illustrate the shenanigans of self-styled “climate skeptics”, take for example the following graph, which has been circulating for a while on climate denier websites. It beautifully illustrates two of the favorite tricks of climate deniers: cherry picking and deceptive trick graphics. If you look at the black arrows, do you have the impression that the 0.71 ° C temperature difference is mainly due to data adjustments? Because the arrow on the right is three times longer than that on the left? Far from it – can you spot the trick? In the vertical axis, 0.3 ° C is missing in the middle! The adjustment is actually only 0.26 °C. Even that is quite a lot of course – and that’s because it is an extreme example. The January 1910 shown is the month with the second largest downward correction, obviously cherry-picked from the 1,643 months of the data series. This graph must be familiar to anyone who works with the NASA data, because it is in the notes to the data on the NASA site (even interactive). Incidentally, Gavin already debunked the misleading representation in Fig. 1 last March on Twitter. Anyone who shows you Fig. 1 without also explaining the big picture as shown in Fig. 2 is trying to fool you. A denier favorite is to suggest that NASA deliberately adjusts temperatures upward to exaggerate global warming. An absurd conspiracy theory, as demonstrated by the basic fact that the net effect of the data adjustments is to reduce global warming. The next figure shows this. If climate scientists were trying to exaggerate global warming they’d show you the unadjusted raw data! The claim that the NASA data can’t be trusted has recently turned up at WUWT once again because we had compared these data to a cooling forecast made by two German climate denialists, and the comparison wasn’t exactly looking good for that forecast. Fritz Vahrenholt and Sebastian Lüning, both former employees of Europe’s largest single CO2 emitter RWE, had made this forecast of imminent cooling in their 2012 book “Die kalte Sonne” (The cold sun), where this forecast is shown in relation to the HadCRUT surface temperature data in running mean over 23 months. So if they don’t like the fact that we compared their forecast to NASA’s GISTEMP data, let’s just do it with the HadCRUT data. Fig. 4 The “Cold Sun” forecast of Vahrenholt and Lüning compared with global surface temperatures of the British Meteorological Service (HadCRUT data), moving average over 23 months to end of October 2016. Graph: Prof. Stefan Rahmstorf, Creative Commons BY-SA 4.0 . Hmm. Still not so convincing for the cold-sun forecast. Thus in defense of their forecast at WUWT, Vahrenholt and Lüning have therefore applied three tricks which reduce the discrepancy of data and forecast. They are no longer taking a moving average over 23 months but over 37. This reduces the observed warming since 2011 (the start of their forecast period) to the end of the data curve from 0.34 to 0.22 °C. They now no longer take surface temperatures but satellite data for the troposphere (RSS data). We could say a lot about the problems of these data – but we will leave that to the senior scientists behind the RSS data, Carl Mears, who explains in this video why the surface data are more accurate. Above all, however, only ground-level temperatures are directly relevant to us humans. We tend to dwell on the Earth’s surface and not in high-altitude balloons. The fact that Vahrenholt and Lüning are now suddenly switching from the original surface data in their book to the less accurate and hardly relevant tropospheric data can only have one reason: this makes their forecast look somewhat less wrong. Specifically, it reduces the observed warming further from 0.22 to 0.13 °C. In their new graph, the forecast curve does not start at the level of the measured data curve in 2011, but has been shifted upwards – so the data don’t stick up so far out of the forecast interval at the end. But even with these three changes compared to the original forecast graph in The Cold Sun, Vahrenholt and Lüning don’t succeed in preventing the observed temperature curve from rising out of their forecast interval. They try to belittle that with the argument that last month’s value just returns to the top edge of the forcast interval – which is irrelevant, however, because this forecast does not apply to individual months, which are always strongly scattered. Fig. 5 The “Cold Sun” forecast of Vahrenholt and Lüning compared with global surface temperatures of the British Meteorological Service (HadCRUT data), running average over 37 months. Graph: Prof. Stefan Rahmstorf, Creative Commons BY-SA 4.0. This still clearly falsifies the cooling forecast of Vahrenholt and Lüning. I have discussed this example here in some detail because it exemplifies the methods of so-called “climate skeptics”. People like Vahrenholt and Lüning trust that a layperson won’t notice their various tricks. An outsider can ultimately hardly recognize these unless he studies intensively the available data and scientific literature. However, applying some common-sense criteria can give a layperson a clear indication of the lack of credibility: the source is a “climate skeptics” website, there is no research institution and no professional climate scientists behind these claims, and there is no peer-reviewed publication with the cooling forecast, rather it is directed exclusively at a lay audience. Finally there is a connection of the authors to the fossil energy business. As in professional journalism, there are several levels of quality assurance in professional science. A long study and training time, which conveys methods and ethics (like the search for truth and the continuous questioning of own assumptions). The standards of good scientific practice (non-compliance, such as manipulation of data, can cost a scientist their job and future prospects.) The reputation as the greatest asset of the scientist and his research institution, that is rapidly lost when making wrong claims. Peer review, i.e. the critical assessment of scientific publications (and even institutions) by independent third parties (mostly competitors). And last but not least, the culture of critical, open debate, which is very much alive e.g. at conferences, which will quickly identify most problems or mistakes. None of this is infallible, and professional scientists sometimes make mistakes. For this reason, one should not necessarily believe every individual statement by a scientist, not even each peer-reviewed publication. It is better to base ones assessment on the bigger picture. There is good reason why every few years, hundreds of climate scientists from around the world voluntarily and unpaid tackle the big task of sifting through the scientific literature and debating it and summarizing the state of knowledge in the reports of the IPCC. There has long been an overwhelming consensus about the basic facts of global warming. Anyone who finds serious, defensible counter-evidence would quickly become famous – a place in the top journals Nature, Science or PNAS would be assured. The likelihood that you will find a scientific sensation on a shrill layperson website like WUWT is infinitely smaller than that you are simply being fooled there. Hmmm. I read both sides of this topic and must say I have not come across any serious argument that supports your initial comment. It’s quite understandable that recent years have had record temperatures. They have been rising steadily since the last ‘Little Ice Age” and the last year or so there has been an El Nino creating a temperature spike that was statistical the same as 1998. Your opening comments lost my attention and your shrill approach turned me off. No wounder I’m a skeptic, this is just encouragement. Thank you for this. As a non-scientist who sometimes struggles with conflicting data it is good to see the tricks being exposed. NB The former UK Environment Secretary, Owen Patterson MP, was on ‘Any Questions’ (Radio 4 political Q&As) on Saturday, asserting that the ‘Pause’ is still continuing and that increased levels of CO2 had a beneficial effect in greening the planet. This was not fully rebutted…. so it goes on. I certainly agree with everything you write regarding the substance, but since you make a big point about not believing “shrill laypersons”, I think is worth pointing out that the graph with the faked adjustments (Fig 1 above) is not originally from WUWT, but from Ole Humlum, who is actually not a layperson, but a geoscientist still active in research – which only makes it so much worse that he puts his name to things like these. If you check the comments in the above piece where I try to confront him, you can quickly notice that he simply makes up an imaginary 10% uncertainty about CO2 transportation (to make it appear that we don´t really know whether oceans are a source or a sink of CO2! ), that he cites obscure popular pieces by Wolfgang Brune (a former DDR/East German scientific advisors he stumbled upon who happens to deny the very existence of the greenhouse effect itself!!) as authoritative sources, and that eventually delves into rubbish about common sense from his humble upbringings rather than adressing the basic scientific points. From my personal exchanges with him, and from seeing him in debates where he consistently does a similar and remarkably poor job against almost any half-decent oppisition, I´d say that it is quite obvious that he does not himself believe his own claims. I have no idea about his motives, but he is not a nutter like Mörner or Monckton, and not an obvious hired gun like Patrick Michaels. I am only mentioning this because there is, unfortunately, a real scientist with some credible expertise behind this particular piece of misinformation, which does make it much harder for people applying your “common-sense quality assurance criteria” to realise that Humlum´s graph is, in fact, consciously manipulated and utterly untrustworthy. I think it would only be fair if Realclimate called Humlum out publicly as “a liar”. Titus, if their “shrill approach” turned you off, why are you still posting here? Troll much? Titus, although I know I will not be able to convince you of anything, I will respond to the above quote from you anyway. First, ask yourself why the global temperatures have steadily increased since the “Little Ice Age”. Temperatures cannot just magically increase, there must be a physical reason for that. ABC (anything but CO2) is the usual ‘answer’ from people that Stefan refers to as deniers. Second, that “statistical tie” is solely in the UAH satellite record (with 2016 higher than 1998). It is not a statistical tie in the surface record. Of course, the “statistical tie” is also a red herring. In GISTEMP and HADCRUT, there are extremely few years that are not “statistically tied” (as in p>0.05) with a prior year. And yet, the global temperature has increased by almost 1 degree since 1880. 1 degree is much larger than the statistical uncertainty. The general direction is up, we know why (primarily anthropogenic greenhouse gas emissions), but still some people will deny all of that, just because they don’t like policy recommendations that politicians propose to curbe those emissions. The opening comments seem on-point to me, and the post is the opposite of shrill — it’s well reasoned and convincing. But your final sentence is telling. You base your ideas about the validity of scientific arguments on your emotional response to the people making those arguments? If the AGU issued a statement that was harshly critical of flat-earthers, would you suddenly become a plate-tectonics skeptic? If the answer is “no”, then take a long hard look in the mirror, because you’re not in fact a “skeptic”, just another person in the grips of motivated reasoning. It’s the trend, Titus. The trend since 1970 or so is relentlessly upward. But ‘skeptics’ like yourself always seem to concern themselves with the noise around the trend. Why is that, one wonders? Uh, dude, the LIA ended in the mid 1850s. 1)Temperatures didn’t really start rising ’til the 1930s. 2)The LIA was not a global phenomenon. 3)Temperatures do not simply rise. They require an energy source to rise. Thank you for being so utterly ridiculous. Voltaire’s prayer strikes again. I fail to see anything shrill about the opening sentences of this article. They are simple, declarative sentences, and the while the second is perhaps most fairly classed as opinion rather than fact, it seems to me to be a very reasonable inference. Why else would you see schlock like this? Eisenhower’s insight is evident in the massive hypocrisy with which ambitious politicians and self-interested academics treat research and teaching that doesn’t conform to “official” academic/political global warming orthodoxy. Federal funds for climate research are awarded exclusively to supporters of the premise that man-made climate change is scientific fact. Natural causes are minimized, because only human behavior can be exploited to impose government control. But I’m afraid I’m guilty of drawing an inference, too, Titus–and that is that you don’t like the truth, either. Fair enough. It’s not a very palatable one, certainly. But not liking it will not make it go away. Titus, the little ice age ended over a century ago. Temps aren’t rising due to coming out of it, because we already came out of it. It seems rather unlikely “Titus” is unfamiliar with Christopher Booker. Thank you for this. I’m a teacher, and my students tend to bring a lot of questions, half-truths and deliberate misinformation to the classroom. This piece has really helped me to get my thoughts and arguments straight again. Although, theoretically, I know all that, I now feel better prepared for discussions and “Miss, can I just ask you a question” situations. I really appreciate that. … and Titus? Wake up. Hiding under the blanket and pretending it’s not happening is not going to help anyone. Can you explain which forcings caused the warming from the years 1900- 1945 and why it cooled so suddenly after that? and the last year or so there has been an El Nino creating a temperature spike that was statistical the same as 1998. The recent El Nino was statistical the same as 1998? How so? hm, anyone searched out pages that do omit the second picture? On temp record: take a look at any historical data and the temp has been rising since way before AGW CO2. Can’t see anything to counter that. On shrills: The word ‘denier’ was used 4 times in the first couple of paragraphs and ‘shrill’ was referenced in the close. Personally I find this language repellent and loses credibility. Baloney. Warming started at the beginning of the 20th century and although it included a component of AGW much was due to increased solar activity. Since about 1970 the AGW signal became dominate and the sun has been relatively stable if not declining. This is all very well documented. Titus – perhaps you have heard about the ~71-year hiatus in LIA rebound warming. I mean, let’s talk about a paws with claws. 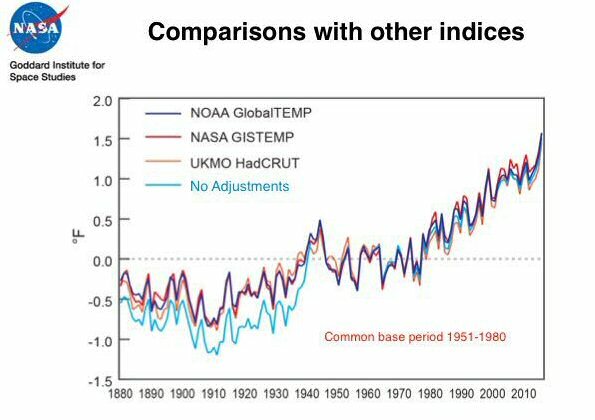 TT 19: On temp record: take a look at any historical data and the temp has been rising since way before AGW CO2. BPL: No, that’s simply wrong. What’s your source for this misinformation? Are you assuming AGW didn’t start until 1970, or something? It started with the industrial revolution. A. The rate of warming has increased significantly. Per “hockey stick”. B. The idea that you somehow know something that literally thousands of peer-reviewed climate scientists and every (yes, every) professional climate science society/organization in the world do not is ludicrous, extremely arrogant, and quite telling. C. The *only* language that is repellent and has no credibility at all is that from those who have no clue and no excuse not to know about how science is conducted via the scientific method. Which has been around for hundreds of years. There is no excuse for such intellectual laziness in the 21st century. Mind to provide some source for that “historical data”, as the historical data I know tell the opposite? Titus, I looked at any historical data, and I cannot find anything that supports your claim. I also note you ignore the criticism of your original claims. Don’t move the goalposts. It removes any legitimacy of your criticism and makes it sound hollow. But maybe that was the intention? Wrong. CO2 has been rising exponentially since the 1700s. You are a denier. Your claim to be a “skeptic” is laughable. You repeatedly post deliberate, blatant falsehoods. Your hypocrisy is repellent and you have no credibility to lose. Post your stupid lies and nonsense somewhere else. While submariners and submarine chasers care a lot about how sonars interact with thermoclines, and use thermobarygraphs as though their lives depend upon it, which they well may do, ships being hunted by submarines tend to be distracted from oceanographic logging accuracy while dodging torpedoes. The fog of war may thus have spilled over into the atmospheric science data base. Hold your wild horse here before we get too carried away in the conclusions. First of all, calling someone a “denier” or similar is nothing a serious scientist would do. You won’t be able to explain all the details in a way that anyone understands it. But for the most of us that are skeptic and have a Ph.D. or similar, you must be able to explain things properly so we can judge if what your are saying is reasonable or not. I got stuck already at Fig1. What does it show? Are you saying that there are adjustments made to the GISS data set more than a 100 years after it was collected? Why was the January 1910 temperature adjusted downwards? Was it found out afterwards that there was too much UHI in the measurement from January 1910? But for the January 2000 there was a adjustment upwards. Did too many measurements happen out in the countryside? These kind of adjustments just doesn’t make any sense. Why do you think people doesn’t trust the GISS data set? I must say, that if you introduce a 0.26C warming by adjustments during a 10 year period it would be exceptionally remarkable if no climate scientist had any concerns or questions about it. But you are saying these specific months were cherry picked. Ok, that is fine. Could you point me to the data where I can find the adjustment values made month by month? This kind of discussion also shows why it’s very important produce openly available data. If the data isn’t available to anyone and analyzed by your worst “enemy”, it basically worth nothing! That’s hardly suprising to us, Titus. By all appearances, you are in denial in the psychological sense, “in which a person is faced with a fact that is too uncomfortable to accept and rejects it instead, insisting that it is not true despite what may be overwhelming evidence.” If you could see any of the overwhelming evidence for AGW, you wouldn’t be in denial ;^). That’s scarcely cause for concern, since the dispassionate language of climate science clearly has no credibility with you to begin with. Your claim to find our more subjective language repellent is disingenuous, however: you obviously don’t find being labeled a denier repellent enough to stop commenting here. Indeed, having mistaken denial for skepticism, you seem proud to be an AGW-denier. For that matter, feigning wounded feelings at being so labeled is a popular tactic among professional AGW-deniers, who use it as a sympathy pitch. Some of them even insist that ‘denier’ and ‘denial’ must be reserved for deniers of the Nazi Holocaust, as if the Holocaust were the only unpleasant fact that can be denied. Getting back to you, Titus: in previous comments you’ve associated acceptance of the fact of AGW with your country’s “Green activists” and what you consider excess government spending. In the US, your political allies self-identify as “conservatives”, who declare their hatred for “enviro-nazis” and oppose government spending on benighted principle. I suspect it’s your fear of ideological enemies under your bed, as much as discomfort with the fact of AGW itself, that compels you to deny it. That’s certainly true of conservative cultural warriors in the US, for whom AGW-denial is a shibboleth for tribal identity. So, Titus, are you offended enough to go away yet? If not, I can try harder. Check out Marcott &al. 2013 (Science 339(6124):1198-1201) on temperature records for the past 11,300 years. Current global temperatures are warmer than about 75% of temps over that period. Stefan had a post discussing this in September 2013. Recent anthropogenic warming has rocketed far above what might be expected from recovering from the Little Ice Age. I’ve looked and I must admit that I’m having trouble seeing what you are referring to. What I see is that the January 1910 temperature has been cooled from the reported temperature of –0.26oC (2008) to –0.45oC (2016). At the same time the January 2000 temperature has been increased from 0.17C (2008) to 0.26C in 2016. So to me the graphic is correct i.e. 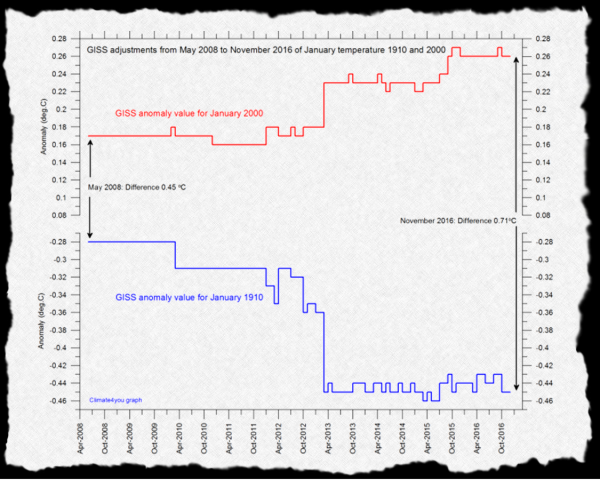 Corrections applied by GISS have increased the difference between the January 1910 and January 2000 temperature from 0.43C in 2008 to 0.71C in 2016. I’m not sure what value including 0.3C in the vertical axis would have as it would only appear at the top of the axis on which the 2000 temperature is plotted – and not as you suggest in the middle (i.e. between the 1910 and 2000 plot). Is there really a trick here? If there is, then I have truly been duped! You go on to say “The January 1910 shown is the month with the second largest downward correction, obviously cherry-picked from the 1,643 months of the data series.” I’m not familiar with the GISS temperature series and the adjustments made. However, it is interesting to note that you indicate that the adjustments to the Jan 1910 temperature isn’t the greatest downward adjustment made. It raises the question as to how many records have been adjusted. Is the upward adjustment to the 2000 data typical of the scale of adjustments made or, as with the Jan 1910 data, are there data with even larger adjustments? It’s a naive question, and I’m asking from a position of ignorance, but is there no means of leaving the past fixed and adjusting only the most current record to account for time of recording, site change etc. etc.? In doing so you will avoid the claim (legitimate or otherwise) that you are creating an artificially steep warming trend by cooling the past and warming the present (most recent). [Response: 1.Why is an arrow for 0.71 °C three times as long as an arrow for 0.45 °C? Mind the gap! Is Titus just a copypaster, or is Titus able to identify the sources for what Titus believes? 7.2 Palaeo-Climatic Variations and Change: Figure 7.1. Also read the narrative which also supports. Secondly, let’s not get off topic. My initial comment was to say that temperature rise is not the issue. As far as I know it never has been and was expected. The issue is around what I understand is called ‘sensitivity’, links to ‘climate change’, ‘extreme events’, ‘ignoring the benefits’ etc. I think focusing on those links would be good. The data of the older versions are downloadable: https://data.giss.nasa.gov/gistemp/history/ . 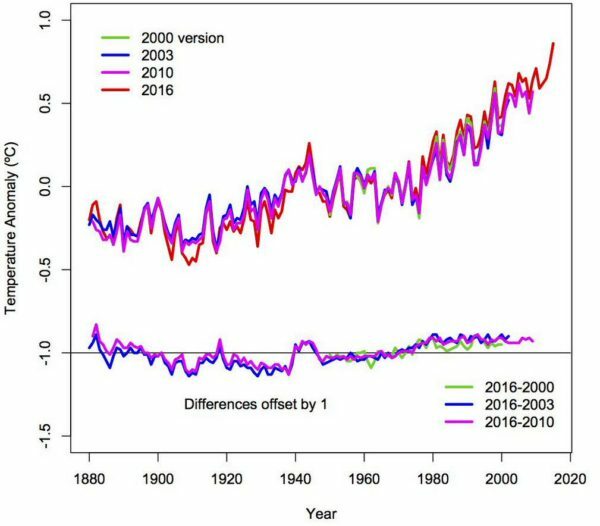 When calculating the differences between the dataset of the year 1997 and the year 2016 (annual data to avoid “cherry picking”) from 1880 on you get the result that 22% of the trendslope 1880 to 1996 is due to the changes in the GISS data. Just to avoid furhter confusion here. If you’re really interested what temperatures likely were in the last several thousands of years, check previously mentioned Marcott et al. 2013, and for last one or two thousand years see ‘Continental-scale temperature variability during the past two millennia’, PAGES 2k Consortium (2013), which used hundreds of proxies around the world. #36–Honestly, Titus, you “choice” a diagram from the *First Assessment Report*? That came out in 1990! Kids born that year are finding grey hairs in the mirror, working on second marriages and starting to wonder about the upcoming generation and its strange ideas. Stop feeding the troll. He is almost certainly deliberately posting out of date science on the MWP to bait you. Post 39 is good, because its a concise accurate response, but now is the time to move on. Don’t over do the responses. The trolls agenda is normally to distract from the original article, (which he has done) get you angry, and promote doubt and confusion. The troll is probably paid, and a professional lobbyist, and is an attention seeker by nature. The troll is probably educated enough to see we are warming the planet, but doesn’t like climate science and is willfully ignorant, because of vested interests of some type. In many cases they don’t like environmentalism or taxes etc, so there will be some ideological baggage leading to deliberate denial of the science. The troll likely has sociopathic tendencies, because most of us would be too ashamed to be so brazen and misleading or dishonest. You won’t ever convince the troll or change their mind. If you are worried about what general readers think of the trolls comments, innoculate them quickly with one good response that links to the real research, and then move on quickly and ignore them. I would like to know if anyone is working on using ocean plankton to mitigate Climate Change using Emiliania huxleyi? It is the single biggest source of Oxygen on Earth. Eats Carbon like there is no tomorrow, and at the rate Methane is dissociating in the Artic there may not be one for kids under 12. Is it feasible to select and drain appropriate swamps or lakes in the Artic areas and lay pipe or cannels to bring in sea/ocean water? The latitude would of course be important. The plankton may prove to be the most cost effective way to reduce atmospheric Carbon. To paraphrase Bill Gates, we need to consider every option. Folks, a few other types of “OTEC” will work also but they are not as efficient as “Ocean Mechanical Thermal Energy conversion” or “OMTEC”. One would be “Ocean Wind Mechanical Thermal Energy Conversion ” or “OWMTEC” and “Ocean Solar Thermal Energy Conversion” or “OSTEC” . Different combinations of all of these can get us out of the quagmire… If you think not then I’ll be glad to give you a blackboard tutorial on the subject and let your scientists work out the maths.. TYVM..
#34 Brian Blagden has 3 questions. 1) What is the trick in the graphic? Brian, the numbers, as you noted, are correct. Stefan called our attention to the black arrows, for 0.45C at the start of the graph and 0.71C at the end of the graph. They are not proportional, because (again, as stefan pointed out) the graph leaves out a big chunk of the vertical axis. As a result, the unadjusted 1910 and 2000 temperatures appear to be much, much closer together than they are after adjustments. Visually, the arrows in the graph suggest that adjustments were about 400% of the unadjusted temperature change from Jan 1910 to Jan 2000. The actual adjustment was about 60%. 3. Would it be better to leave past temperatures fixed and adjust only current data, to avoid the charge that you are manipulating the data to exaggerate the warming trend? Failure to correct errors, or to adopt improved methods, or to make use of additional good-quality data is manipulation and will hinder the goal of improving our understanding of the natural world. Scientists cannot control what charges are made against them. They best establish/maintain credibility by doing careful work using the best data, knowledge, and methods available, and by carefully consider criticism that might lead to improvements. I fail to see it as much of a “trick.” Graphs often contain gaps in order to emphasize the data at the ends. The differences (0.71 and 0.45) are clearly stated. I would caution on the falsification of the “cooling sun forecast”, until more time has based. Remember the falsification of global warming due to a few years of the hiatus or an ice-free Arctic after a few years of expanding sea ice? Let’s not do the same here, lest we are seen as no better than they are. I did an investigation of the contribution of different forced and unforced contributions to the warming trends in such periods. It was for 1910 to 1940 and for 1940 to 1970 but I redid it for your mentioned period 1900 to 1945. I’ve used the Land + Ocean temperature data from BEST. No single cause dominated the temperature changes in that periods. But if some changes are in the same direction for some decades they can add up to a larger temperature change. If the are in different direction the may cancel out. Almost equal contribution from human forcings, natural forcings (mainly recovery from large volcanic eruptions from 1883 to 1912), oceanic cycles, and uncorrected SST measurement errors for this period. Change in trend caused by chances in oceanic cycle and volcanic forcing, total human forcings linear in this period (1910-1970) change in GHG increase and aerosols cancels out. And there is an uncorrected jump in SST from 1936 to 1937. Thanks Stefan, Frank and Ottnott for getting back to me – much appreciated. As I said in my initial comment (and the past post you sight) the ‘denier’ talk turns folks away and strengthens their opposition to what you are trying to say. So trying harder will just build high walls. I’ll try again: My original comment was that rising temperatures are not at issue, rather, they are expected. By focusing on it I believe you are increasing the doubt. It’s all the associations to it that are creating the serious questioning and skepticism. Oh. Didn’t notice a date on the IPCC report. It just looked the same as many others and being the IPCC I thought it would be acceptable. No deeper reason. BWAAAHAAAAAHAAAAA. Oh, thanks, Dan, I needed a good laugh tonight. Titus@48, And I’ll try again–temperature doesn’t just rise. Rising temperatures represent increasing energy–and when we’re talking the temperature of an entire planet, that represents a LOT of energy. So, the question for you–AGAIN–is what is the source of that energy. It cannot be the sun. Solar output is decreasing. It cannot be the oceans. They are warming up, too. So, where is the energy coming from? Leprechauns? And for a bonus, explain why the temperature of the stratosphere is falling as that of the troposphere rises.